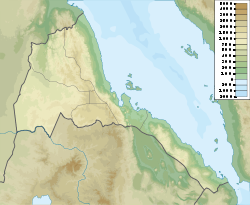 Bay of Beylul or Bēylul Bahir Selat'ē, also known as Badi Bay, is a bay on the Red Sea, on the coast of Eritrea. The bay is located about 450 km southeast of Asmara. The Bay of Beylul is open towards the north and the Hanish Islands lie 50 km to the northeast. The eastern headland is Ras Darma. The settlement of Beylul lies on the western shore of the bay. ^ a b "Bēylul Bahir Selat'ē". Mapcarta. Retrieved 14 October 2016.